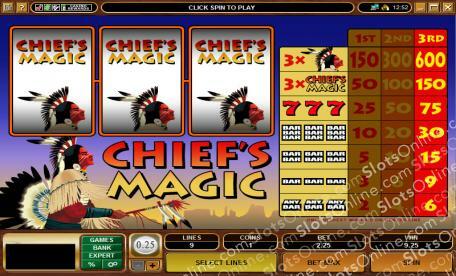 The Chief's Magic slots have a Native American theme that meshes well with the classic 3-reel slot design. Click here to play! The slots have a single payline, and no special features, so they are accessible to new and old slots players alike. As usual for standard Microgaming 3-reel classic slots, the lower paying symbols are BAR symbols of various types and red 7s. The major prizes are paid out with combinations of the Chief's Magic Logo symbol and the Jackpot Chief symbol. These slots will not really appeal to bonus slots players, as the Chief's Magic slots are about as basic as you can get. This isn't a bad thing, as simple slots can be great fun to play when you are trying to kill time while waiting for something else and you do not want to get overly distracted. It just means that this is unlikely to be the game most slots players would choose as their primary slot machine, even if it offers a very decent jackpot when the maximum of 3 coins is played.